Home / News / News: New Year, New Us! Harding Energy is excited to announce that after 26 years of service, our president, Steve Morgan, has acquired enough common stock to become the majority owner of Harding. Already, Harding has seen positive impacts from this for our customers and our company as a whole. In order to achieve continued success, Harding has made some changes to personnel; internally and externally in regard to the support staff who have been chosen to help bring future success to Harding Energy. 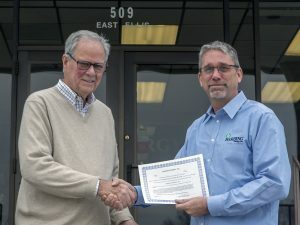 Utilizing Steve’s knowledge and ideas, Harding is implementing new plans for additional capital and growth with new product development, new manufacturing techniques, and new acquisitions. Harding is focusing on becoming more streamlined, enabling us to provide higher quality and improve our focus and support to both existing and new customers. We are also working to build a better understanding of the battery power needs in an ever-changing world which has a constant demand for portable energy.